The correct concert photography settings are key to getting great photos in small and murky concert venues. 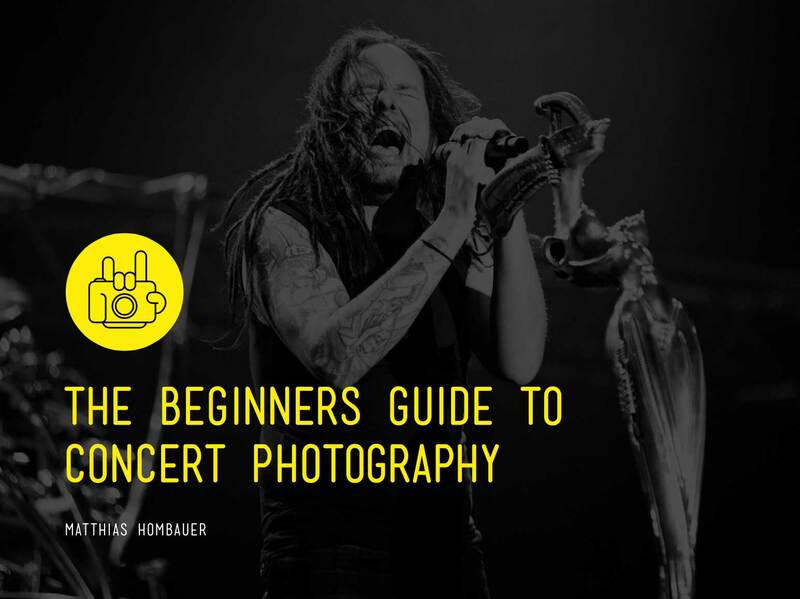 Unfortunately, the automatic mode on your camera simply won’t do the trick and for a lot of concert photography beginners, the journey already ends at this early stage. In this article, I’ll share some of the basic concert photography settings and I promise they’ll help you to immediately boost your career as a concert photographer. Let´s jump right into it. In Aperture Priority mode you tell your camera the aperture you want to use and the camera sets the shutter speed accordingly. This is a setting I used for years. Why? Because you’ll be stressed enough with all the other things going on around when shooting your first concerts. Appreciate this help from your camera. “Use fast lenses and shoot them wide open”. This quote you´ll hear a lot from concert photographers. Due to the low light situation on stage, it´s crucial to set your aperture to the smallest number on your lens e.g. f1.8 or f2.8 (which reflects a big aperture). This allows the most possible light to enter your sensor and is one of the must-have concert photography settings. The best prime lenses have an aperture of f1.4 or f1.8 whereas good zoom lenses have an aperture of f/2.8. For Beginners on a budget, I highly recommend the 50mm f1.8 which is a no-brainer for concert photography. Read on here if you want to know more about the camera gear for beginners on a budget. Have you ever been on a gig where the artist was hyperactive jumping from one side of the stage to the other? To freeze these movements you have to use a fast shutter speed. In general, I try to get a shutter speed of 1/200sec and faster. Otherwise, you risk blurred photos. If you are shooting singer/songwriter who is sitting on a chair and barely moving, you can try longer shutter speeds such as 1/60. Some people even prefer motion in their photos, but for my photography style I want to freeze the action and therefore a fast shutter speed is one of my concert photography settings. Set your camera to a HIGH ISO value. ISO or film speed refers to the sensitivity of an analog film. Today the term is used for the sensitivity of your digital sensor. Start with an ISO setting of 1600. Take a photo and have a look at the LCD monitor on your camera. Is the photo blurry? Then your shutter speed is too slow. Crank up the ISO setting to 3200 (if possible) and try it again. Just keep in mind: The higher the ISO setting the warmer the camera sensor gets and the more noise you will encounter in your pictures. Therefore try the keep your ISO in your concert photography settings as low as possible and as high as necessary. Learn more about Aperture, Shutter Speed and ISO in this article here. Set your camera’s internal light meter to spot metering. This takes a light reading limited to a very small percentage in the camera viewfinder. When shooting concerts, you will often find yourself in a situation where the artist is lit by a spotlight and the rest of the stage is almost dark. When using spot metering mode, aim to place the artist’s face in the middle of your viewfinder and you’ll get the right exposure for it. When using the Matrix (or evaluative) metering setting, the camera will take a light reading at several points in the scene and you’ll probably get overexposed faces if the background is dark. The reason why we have to use the white balance setting is to get the colors in our pictures as accurate as possible. As you can imagine in concert photography, the light situation can be different within seconds. You can change the white balance setting on your camera to different predefined color temperatures. However, one of my concert photography settings is to keep the white balance on auto mode. You still have to ability to change the white balance setting afterward in post-production. I always get the question from people asking which gig photography settings they should use. One of the questions is: Autofocus or manual focus? I love shooting old analog cameras and manually focusing is a breeze with a Hasselblad or a Mamiya. But not with our DSLRs. Therefore I definitely would not recommend to manually focus your lens at your first concert. Your camera might have some problems to autofocus in very low light situations, but still, Canon and Nikon cameras/lenses do a great job. So, set your lens to Autofocus and forget the rest. Using the JPEG format means that your camera already processes the pictures and you won’t have to do the post-production of your photos afterward. This format has limitations but as a first step, it’s absolutely fine. Why I am not suggesting RAW? For the people who disagree here, I’m a 100% RAW shooter, but I think when starting out, you might not be familiar with post-processing RAW data in Photoshop or Lightroom. I want you to succeed from the get-go and keep your motivation levels high. So, JPEG first, RAW later. Read on here if you are planning to shoot your first concert! Set your camera to multi-shot (burst) mode. It allows you to rapidly shoot three to four photos in a row (depending on the frames per second of your camera model). It’s more likely that at least one of the four photos is tack sharp whereas the others might not be in focus. This is not one of the must-have concert photography settings, but it helped me a lot in the beginning. In general, you are not allowed to use a flash in concert photography. Imagine ten photographers burst their flashes at the same time. This would be quite annoying for the artist and this might also the reason why they came up with the rule “no flash” in the photo pit. My recommendation is to learn concert photography using the available light. However, I learned that in smaller clubs with low light situations flash can make a big difference. I recently was on tour with the Swedish punk-metal Bands Atlas Losing Grip. Using my flash allowed me to freeze the jumps on stage and I was pretty amazed by the photos. Like I said before, I wouldn´t recommend flash in general, but if you know the band and it´s fine for them. experiment with it. Congrats, you made it through my 10 concert photography settings for beginners! These 10 settings are no rules that you have to obey, but they’ve helped me building up my portfolio and becoming the music photographer I am today. So, chances are good that you´ll also benefit from them for your own work as a concert photographer. With these concert photography settings in mind, you´ll be able to get awesome results even when you are just starting out. So, print out my 10 Concert Photography Camera Settings as Checklist (free PDF) and take it with you for your next concerts. Let me know which concert photography camera settings you are using in the comment section below.